Welcome to the home of the FC Tigers Soccer Academy! 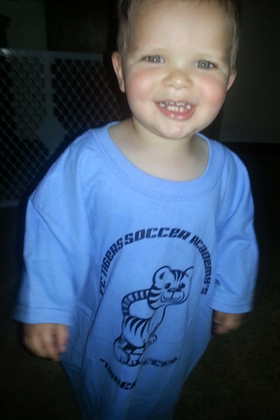 The Fall 2016 Pre K Tigger Soccer Program is now open! Contact Gbeh@aol.com for a registration form. Season begins Sunday, September 11th at 10 am. Congrats to both the Boys Under 16 Pepperell Team, who WON, for a second year in a row, the tournament title for their age group! Both the girls and boys U16 Pepperell Team WON their age groups, first time in 11 years of going we've had champions, and two this year! Congrats to all the players, they are not only incredible kids, but awesome players too. Look for a chance to defend their crown in 2015! My insurance has asked that I complete this training, and I have (certificate and form can be found in the hand out section). I will also ask any new coach/volunteer, age 16 and above to also be certified from now on (10/6/13). Check out the latest press on our games at, http://www.wickedlocal.com/maynard/news/x690036413/Indoor-soccer-action#axzz1kc0t2SNc . **** Check out our "LINKS" page for instant links to some of our favorite web sites! Also look at our "SPONSORS" page to find out which local business' are helping to sponsor our programs! **** If your company, business, or family would like to help "SPONSOR" a program, player or the Academy, which will allow us to lower fees and offer scholarships for kids in need, please contact Geoff at geoff@fctigers2.com or go directly to the "DONATE NOW" link. We don't want to turn away any child who wants to play, just because of difficult times, so please try to help! Thanks to JJ Hardwood Floors once again this year in helping us to offer more scholarships to those families in need! **** FC Tigers SA is NOT affiliated with Maynard/Sudbury Recreation, The Boys and Girls Club of Assabet Valley or any town/club youth soccer group. We rent facility time from them only to run our indoor and outdoor programs. They do help us in facilitating programs, but I wanted to make sure it's clear that FC Tigers SA is a seperate entity. **** FC TIGERS APPAREL for sale, click on the link "gear and apparel" to see it all! Show your team off! **** Also avalible in the hand out section is The FC Tigers Soccer Academy's Harassment/KidSafe policy and Employment/Volunteer packet, both avalible for download. **** Mulit player discounts are avalible but vary per program. Limited scholarships may also be avalible per program. Player cancelations/refunds after registration/start of program vary per program. For any of these issues, please contact Geoff at Geoff@fctigers2.com for more help and info! **** FC Tigers Soccer Academy reserves the right to adjust any policy or program as deemed necessary.